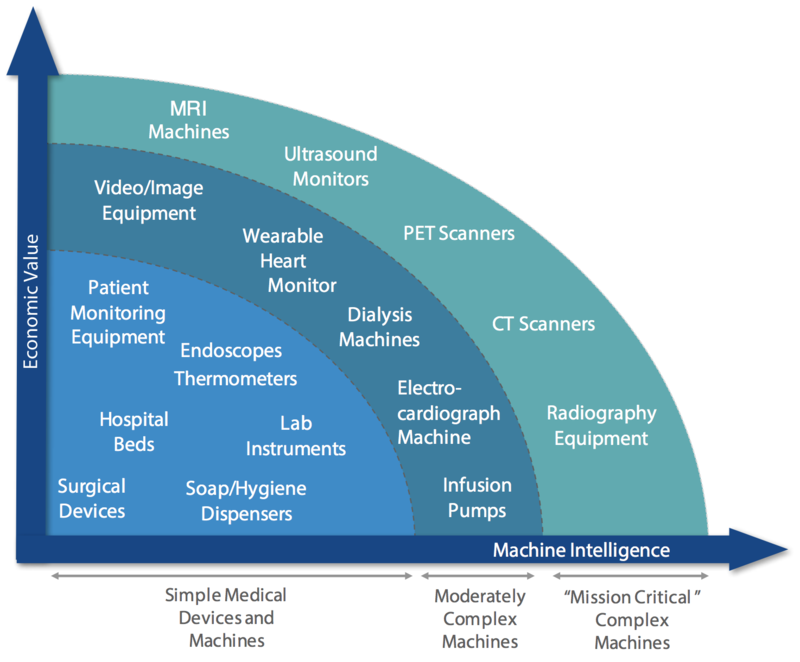 Healthcare equipment manufacturers and providers have embraced the Internet of Things (IoT), connecting machines to networks to enable analytics and draw insights on better support and utilization metrics. However, most machine data management tools can only analyze simple sensor data and basic historical log data. Today’s tools are only scratching the surface of the value of complex machine data. If ever a sector of the economy needed smarter systems to enable optimization of business and operations processes, it’s healthcare. The healthcare arena offers untold opportunities to apply IoT and Smart Systems technologies to increase awareness, knowledge, efficiencies and actions. According to several sources, global healthcare expenditures expanded to over $8 trillion dollars in 2016; capital expenditures for machines, devices and equipment totaled over $350 billion. Healthcare delivery organizations are discovering the many and diverse opportunities that networks, sensors, intelligent machines and transactional software like CMMS (Computerized Maintenance Management System) create. The healthcare sector has put significant investment and resources into new technologies for automated diagnostics, remote patient monitoring, medical equipment monitoring and drug and supply chain tracking. Today, the average 200+ bed hospital has over 250 brands of equipment and devices, and the typical hospital patient comes into contact and interacts with over 75 devices per day. The speed and scale at which manufacturers are integrating automation and data analytics into healthcare equipment systems is staggering. These innovations are aimed at revolutionizing the quality, consistency and efficiency of equipment and devices in support of patient care. But are users realizing the maximum benefits from these new tools? We think not; but why? Today the healthcare sector has one of the highest rates of adoption for connecting machines. However, connectivity alone may help the manufacturer of the machine provide more efficient service and support, but it does not allow the healthcare provider to leverage much intelligence across diverse systems with multiple brands of machines. This is due to several factors, including technical integration complexities, networking standards and differing approaches to embedding intelligence in machines. Existing technology has proven cumbersome and costly to apply with many conflicting protocols and incomplete component-based solutions. The challenges of gathering machine data and integrating diverse data types have been big adoption hurdles for healthcare industry customers wanting to analyze the data from their machines and systems. If what we’re speaking about could be summed up in a word, it would be ‘optimization’, but you cannot optimize anything or any system without addressing the whole system. So, how should users and manufacturers of medical equipment and devices be thinking about automation and optimization of healthcare systems? Today, most networked machines in healthcare market are limited to “simple” applications such as remote monitoring to enable basic alerts and alarms as well as tracking and location services. Return from simple applications, while extremely valuable, is limited primarily to the manufacturer’s service delivery efficiency. Contrary to what current market offerings depict however, the value of connectivity does not have to end with simple applications focused on a single class of device. Moving from “simple” to “compound” applications involves multiple collaborating machines and systems with significant interactions between and among devices, data, systems and people. No longer is the focus solely on the machine builder’s ability to deliver support for their product efficiently. Rather, value is created for the customer by analyzing the entire fleet of multiple modalities from various manufacturers, along with the automation of business and operations processes, and systems optimization. As technologies mature, machines will continue to evolve to higher levels of intelligence that will enable new compound applications. However, as medical devices become more complex, so too will the challenge of extracting intelligence from machine data. Higher-end medical devices that have significantly more embedded computing power and sophisticated software are producing an expanding diversity of data types and structures, particularly complex “machine logs.” A major driver of the need for new data transformation and management tools is both the diversity of data types and the complexity of the machine logs. While there are many factors that contribute to the challenges of analyzing complex machine data, the most underestimated and significant hurdle is data transformation. Unfortunately, this is a topic that has been confusing and misunderstood for too long. Many healthcare delivery organizations know that machine data is a critical enabler of more effective and efficient support, but are often frustrated because they are not getting the value they expect from connected medical devices and machines. The vast majority of IoT data solutions currently on the market can only address sensor and simple log data; these solutions are not able to address the growing amount of complex, multi-structured log data produced by today’s equipment.